Ekovaruhuset Eco-Fashion Boutique Opens In Paris! Although eco-fashion is fairly ubiquitous by now, surprisingly little can be found in the birthplace of fashion and couture: Paris. 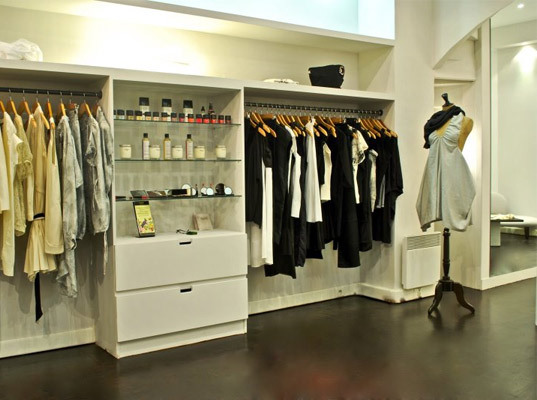 But now Paris, the city where high fashion and eclairs somehow manage to coexist in harmony, has a new eco-boutique! Ekovaruhuset just had their grand opening, and we were there to parler français! There are already boutiques in Stockholm and New York, offering fair-trade, eco-conscious and organic clothes from a slew of some amazing designers like Johanna Hofring (founder of Ekovaruhuset), Meiling Chen, Xing Zhen Chung-Hilyard, Melissa Kirgan, Mika Machida, and Kaori Yamazaki. We were thrilled that entrepreneur Helene Sananikone was opening up another store in Paris, and Ecouterre fashion expert, Yuka Yoneda, went to the City of Lights to get the down and dirty on the new digs. The store is an eco-fashionista’s dream come true with beautiful mirrors, white couches, door pulls made from twigs, and racks and racks of colorful organic clothes. Some of Yuka’s favorites included Meiling Chen’s flowy and flattering natural dresses, along with pieces from Camilla Norrback’s eponymous label. The boutique doesn’t just sell clothes, either. 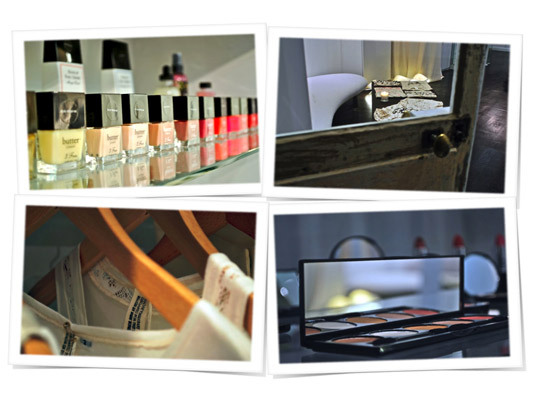 They also have a well-curated collection of organic cosmetics and Parisians will be delighted with the selection. If you’re there, look for some of our favorite brands: Butter London, Nvey Eco, and Timothy Han. You’ll even find fashions for the little eco-fashionisettes: Victoria Christmas and Little Anh-Em.